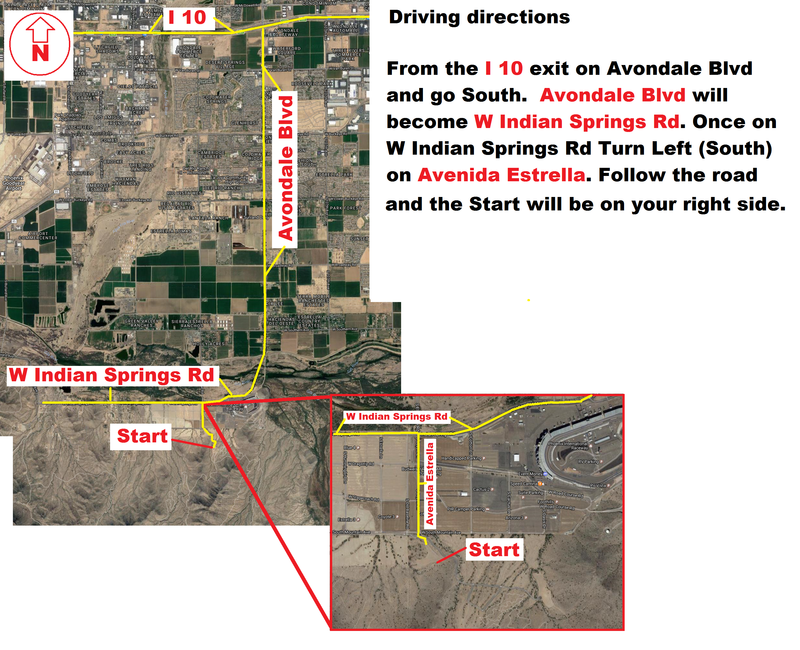 The half marathon starts at the Estrella Mountain competitor track and finishes at the Estrella Mountain Coldwater trail. The course consists of a trail run through the Estrella Regional park mountains. Click HERE to see driving directions. Please note: Estrella Mountain Regional Park has a $7.00 per car. We will provide transportation from the Finish line to the starting line. All participants must park at the finish line to pickup bib number. We have a shuttle van from 6:00 am to 7:00 am. Half Marathon finishers will receive a finisher shirt, finisher medal and a vest. Medals and shirts are finisher items. These will be given at the finish line. 12/10 – Last day to order your t-shirt / vest. Any registrations after 12/10 will get t-shirt/vest size upon availability. Half marathon finishers will have access to the VIP area after finishing where we will have cold drinks, fruit, snacks and food for you to enjoy. Click HERE to see the swag. Course description to be updated at a later time. Participants will have 4.5 hours to finish the course. The course consists of a trail run with a series of climbs and descents. The route has a total ascent of 1111.4 ft and has a maximum elevation of 1,411.12 ft. and it consists of natural trail and clean flat-ish trail. There are two major hill climbs the first climb is located at the start of the race and is about .6 mile long. The second climb is at mile 10 and is about 1/4 mile long. Overall the course is very clean, there are a couple of sections of 5 to 10 feet long where caution is important to void injury. We strongly recommend for all participants to run with a hydration backpack. Your safety is our priority, we will have multiple aid stations. We will have awards for the top 3 male and top 3 female and to the first 3 in the following categories for each event. *You must be present to pickup your award, awards will not be saved or mailed. Age group awards can be picked up as runners finish. No double dipping on top 3 awards and age categories. The event will be professionally time by Race Timers using a disposable timing chip. Live results will be posted online and onsite. Timing will be based as followed. At start we will have a gun start and a the finish will be a chip time.